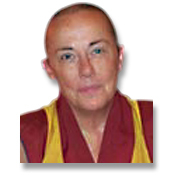 SPECIAL NOTE: To download an MP3 file directly to your hard disk, right click on a link listed above and use the command "Save Target As..." or "Save Link As..."
Venerable Robina Courtin has been a Tibetan Buddhist nun for twenty-three years. She was the editorial director of Wisdom Publications until 1987. At the end of 2000 she resigned as editor of MANDALA, international magazine of Buddhism, to increase teaching at Buddhist centers around the world. Since 1997, she has run the Liberation Prison Project for Buddhist Practitioners, which works with people in prisons throughout the US, helping them with their practice and studies by writing them and sending books and tapes and other materials. She visits prisons in California, Massachusetts, Kentucky, North Carolina and Virginia, giving teachings to groups and meeting them one-to-one. Several of these men are on death row or have life sentences, and some have been involved in gangs, both on the streets and in prison. Venerable Robina was born in Melbourne, Australia and brought up as a Catholic. She studied classical singing until her early twenties, then went to London in 1967, where she lived for four years. She became actively involved in the radical left, working mainly with a London-based support group for black and Chicano prisoners. In the early seventies she became a feminist and returned to Melbourne in 1972 to work with other radical feminists. Robina began studying martial arts in 1974 in her quest for a spiritual path, moving to New York where she studied karate. She continued karate in Melbourne until 1976, when she attended a Tibetan Buddhist course in Queensland given by Lama Yeshe and Lama Zopa Rinpoche. She went to Kathmandu, Nepal, eighteen months later, in November 1977, and became ordained as a Buddhist nun at Kopan Monastery.